The Swansea University, Centre for Sustainable Aquatic Research in collaboration with SMARTAQUA welcomes the Welfare Indicators for Novel Species in Aquaculture on the 14th of May, 2019. Scientist Carlos Garcia de Leaniz, a professor in aquatic biology and Director of CSAR, warned that fishing for salmon – even on a catch-and-release basis – is contributing to its decline. He said this generation’s grandchildren may grow up unaware that salmon was once wild rather than farmed. He said: “It’s a scandal, an absolute scandal. To think that something that has been part of our culture for perhaps 100,000 or 200,000 years can disappear in a matter of a few decades is just tragic. It is absolutely tragic. “We meet with resistance from governments who just refuse to see it. They delude themselves with catch quotas of five, 20, 30 fish. “Can you imagine a conservation programme for, say, the tiger, cheetah, or black rhino where hunters are allowed to catch five or 10 individuals? Or even to engage in catch-and-release? How can we contemplate a scheme where we catch fish simply for fun and put them back in the river in the hope they are going to survive? Of course they are damaged by it. “Catch-and-release is just like shooting black rhinos with darts, and only for fun. Would you do it? “The problem is that, regardless of the direct and indirect mortality it may cause, it masks the real problem and distracts people from the real issue, which is that wild populations are going extinct across the range, particularly at the southern edge. “Catch-and-release is perhaps a cynical way of saying it’s business as usual, and it allows anglers to keep at it – since fish are ‘released’ they can be caught again. Farmed fish are typically reared at densities much higher than those observed in the wild, but to what extent crowding results in abnormal behaviours that can impact welfare and stress coping styles is subject to debate. Neophobia (i.e. fear of the ‘new’) is thought to be adaptive under natural conditions by limiting risks, but it is potentially maladapted in captivity, where there are no predators or novel foods. We reared juvenile Nile tilapia (Oreochromis niloticus) for six weeks at either high (50 g l-1) or low density (14 g l-1), assessed the extent of skin and eye darkening (two proxies of chronic stress), and exposed them to a novel object in an open test arena, with and without cover, to assess the effects of density on neophobia and stress coping styles. Fish reared at high density were darker, more neophobic, less aggressive, less mobile and less likely to take risks than those reared at low density, and these effects were exacerbated when no cover was available. Thus, the reactive coping style shown by fish at high density was very different from the proactive coping style shown by fish at low density. Our findings provide novel insights into the plasticity of fish behaviour and the effects of aquaculture intensification on one of the world’s oldest farmed and most invasive fish, and highlight the importance of considering context. Crowding could have a positive effect on the welfare of tilapia by reducing aggressive behaviour, but it can also make fish chronically stressed and more fearful, which could make them less invasive. 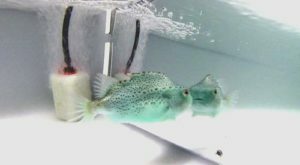 Demand for lumpfish (Cyclopterus lumpus) has increased exponentially over the last decade, both for their roe, which is used as a caviar substitute, and increasingly also as cleaner fish to control sea lice in salmon farming. The species is classified as Near Threatened by the IUCN and there are growing concerns that over-exploitation of wild stocks and translocation of hatchery-reared lumpfish may compromise the genetic diversity of native populations. We carried out a comparative analysis of genetic and phenotypic variation across the species’ range to estimate the level of genetic and phenotypic differentiation, and determined patterns of gene flow at spatial scales relevant to management. We found five genetically distinct groups located in the West Atlantic (USA and Canada), Mid Atlantic (Iceland), East Atlantic (Faroe Islands, Ireland, Scotland, Norway and Denmark), English Channel (England) and Baltic Sea (Sweden). Significant phenotypic differences were also found, with Baltic lumpfish growing more slowly, attaining a higher condition factor and maturing at a smaller size than North Atlantic lumpfish. Estimates of effective population size were consistently low across the North East Atlantic (Iceland, Faroe Islands and Norway), the area where most wild lumpfish are fished for their roe, and also for the aquaculture industry. Our study suggests that some lumpfish populations are very small and have low genetic diversity, which makes them particularly vulnerable to over-exploitation and genetic introgression. To protect them we advocate curtailing fishing effort, closing the breeding cycle of the species in captivity to reduce dependence on wild stocks, restricting the translocation of genetically distinct populations, and limiting the risk of farm escapes.